Vacation rental condominium. Sleeps 8, 3.5 bedrooms, 4 bathrooms. No pets allowed. Fully stocked kitchen with anything you need for breakfast, lunch or dinner. View from master bedroom downstair as you walk out on the patio. Balcony view in the summer. We have a nice gas grill too. The photo is taken on Shadowbrook property, right outside the condo. Can't get any closer to Fanny Hill than this. Don't forget your swim suits. Yes, the pool is heated. Fully stocked kitchen, recently remodeled. Master bedroom upstairs with lovely views and a newly remodeled full bathroom and a private balcony facing the courtyard. Large bedroom downstairs with a beautiful full bathroom. Perfect for 2 single friends or family member. This bedroom has it's own private bathroom with a tub. It also has the washer and dryer in the hallway to the bathroom. The sleeper den has a wooden divider to make room private to include a beautiful private bathroom. The den has oversized day beds. 3 Bathrooms have glass walk in showers. They are beautiful! One bathroom with bathtub and shower in the 3rd bedroom. Vanities in all the bathrooms are brand new! An added touch to the condo this year. 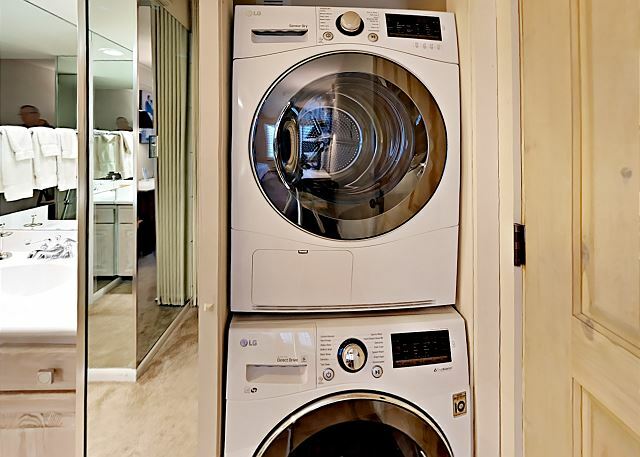 Stackable washer and dryer in the condo. They are located downstairs in the 3rd bedroom with the 2 twin beds. Welcome to our home. We invite you to be our guests and live like well-resourced, pampered locals in the best-situated ski in/out two level condo on lower Fanny Hill. Unit 102 is centrally located two levels below the Snowmass Mall and the Skittles lift, which provides a short ride to Snowmass’s Base Village. If the other mountains are calling you or you would like to head into Aspen or the airport, you can be at the complimentary RAFTA and Village Shuttle bus stops in a short downhill walk. Leaving a car at home is no problem or if you are driving in we have a covered parking space right at the front door. Recently updated in a farmhouse style, there are two full master suites. The upstairs one has a wood burning fireplace and private deck and the downstairs master has a patio with direct ski slope access via a flat three minute ski path to Fanny Hill and the Six Pack lift; or head directly across the hill for a short ski run to pick up the Elk Camp Gondola, great for ski school and access to other parts of the Snowmass Mountain experience. There is another downstairs bedroom (with the same ski in/out patio access as the downstairs' master) and 2 twin beds, perfect for kids or single friends. There is a full size washer and dryer in the laundry closet and this bathroom has a tub/shower. Upstairs there is a sleeper den with two twin beds, its own bathroom and a gliding wooden wall to provide privacy as needed. Our kitchen is fully equipped with everything you need for cooking, preparing snacks or making your favorite beverages. If desired, you can take the Village shuttle to the local market, a few stops down the hill and stock up on the food particulars for your crew. The kitchen island has seating for 4 and a dining room table for 6 people. The living room has a flat screen TV providing HD stations with a wood burning fireplace and plenty of seating. Step out on the balcony just off the living room and enjoy the fresh mountain air while grilling a delicious dinner. You can sit out on the balcony and watch the skiers/boarders ski/ride by the Shadowbrook or relax in the living room with a book, take a nap, or work on a puzzle, there are plenty to choose from. Our friendly management staff will see to your every need. Most of our guests return year after year, and our new guests say "We're so glad we found you!" Come experience a wonderful vacation at Shadowbrook Condos in Snowmass Village. This condo screams memories for your family and friends. Overall, wonderful! Location, pool/hot tub spas same. Laundry in unit a big plus. Amenities great. Kitchen very well equipped. Furniture/beds comfortable. Slope proximity and views wonderful. The following are NOT actual complaints, as they didn't significantly interfere with the truly great time we had; just FYI: 1) Leaking kitchen faucet and faulty sink installation (should have been noticed prior to our rental). 2) Circuit breaker serving 2 downstairs bathrooms blew with hair dryers being used in each BR simultaneously. 3) The thermostats didn't actually seem to control much of anything. The upstairs stays hot and the downstairs cold no matter what, even tho none of the radiators ever seemed to actually heat up? 4) ? source of the constant humming, mechanical noise affecting the up- and downstairs master bedrooms. 5) The kitchen could use a vegetable peeler, steamer insert for the large cook-pot, & maybe a simple knife sharpener (we did a LOT of cooking- pasta, salmon, enchiladas, pancakes, etc.). 6) The track on the sliding room divider upstairs needs adjustment/repair; very difficult to close/open past the half-way point. We are so happy that you had a wonderful time in Shadowbrook 102. It was a pleasure meeting you and having you as our guests. Thank you for taking the time to give us feedback. It is too bad that the faucet started to leak while you were here. We were happy to drive down to Lowe's and install a new faucet as soon as you told us about it. Most of the other issues you noticed could have been resolved easily if they were told to us as well. Our goal is to offer you a carefree vacation. Sometimes the heating zone valves stick open or closed, and we can easily fix those immediately when told. We will check into the circuit breakers, humming noise, and door slider. This condo was newly remodeled last fall, and we haven't had any similar comments, but we will certainly assess the issues right away. Thank you for bringing them to our attention. As far as kitchen items go... we do a complete inventory of kitchen items before each season and replenish anything that is missing. During the season, when guests tell us that something has gone missing, we are happy to run right out to the store and get what you need. And if a specialty item is not usually stocked, we are happy to either purchase one or bring our own from home for you to borrow. We look forward to your return visit next year. Be sure to chat with us about anything you need while you are here and we will be happy to assist you right away! We just returned from our annual trip to Snowmass. We have stayed a several Shadowbrook condos throughout the years. The one we stayed in this past visit was just perfect. The unit is well appointed, updated, bright and cheery, with great views of the Snowmass base. We look forward to staying there again. Sherry in the Shadowbrook office was exceptional. Thank you for your review and we are glad you enjoyed Condo 102. It's one of our guests favorites as it is slopeside and they just recently remodeled the entire condo. We look forward to seeing you next year. Thank you!! We have stayed at the Shadowbrooks Condo for many years. The staff is always so polite, helpful and accommodating! The condos are in the perfect location for skiing and access to Snowmass Village. Condo #102 was fantastic - new bathrooms, comfortable living room, and the floor plan was perfect for our party of 6. We would highly recommend and plan on being back soon! Thanks! We are happy to hear that you enjoyed the newly remolded Condo #102 and its great location, just a few steps from Fanny Hill. Thank you so much for the great review and are pleased you enjoyed our stay and our staff. We look forward to seeing you next year! Thank you so much for the review! We hope that you will return to Shadowbrook in the future. THis is the second year that our racing team has stayed at Shadowbrook. Both years we've found the management to be exceedingly helpful and cooperative. The accommodations were perfect for our team. Go Team!! We are pleased you returned to Shadowbrook and was it was fun watching you have fun! We hope that you will return next year! Overall, our time at Shadowbrook was excellent. The condo was clean, in an excellent location, had all the necessary kitchen/cleaning utensils, and what a view. There are a few features that are original (toilets, bathroom fans, light fixtures) however, they all were operating. There is no a/c which I'm sure normally isn't an issue but the lack of fans and screen doors made our mid July stay a warm one. Summer in Snowmass is beautiful. I highly reccomended this property for families or a group of close friends. It offers so much. It has pool access, is within walking distance of upper Snowmass Village, and the free bus/gondola are easily accessible. Thank you so much for your feedback on your condo. We hope you had a great birthday during your stay with us! The condo has new ownership and they are anxious to hear your comments! We will suggest to the owner to have a couple of fans in the closet for the few hotter days in mid-summer. Again thanks so much for your review. We hope to see you again in the future! This is our second year in this condo (which tells you how much we like it). It is very roomy and comfortable and well maintained. It is truly ski-in, ski-out as you can walk out the back door, put on your skis and are a few feet from the trail. The condo is convenient to the Snowmass Mall. And the pool/hot tubs are only a short walk down the steps. There is an adult hot tub in a secluded grotto which is very nice. Also, Sherri, the manager, is very helpful with information about ski rentals, lift tickets and restaurant recommendations. Aside from taking forever to get hot water, we had a stellar experience. I would recommend this property. Could not have asked for more. The location is just perfect, literally a few feet from the slop to jump in and out the slopes. Also a few minutes walking from the Snowmass Village Mall. The apartment is really nice, clean, spacious, large bedroom, very comfortable and well equipped. We truly had a great stay and look forward to be back. Very good size to fit many guests comfortably. Location was great! This is a wonderful facility. We have been coming here with our family for 8 years and love it! The facility is lovely - the location is perfect, and the staff is outstanding (very friendly, helpful). They all really go above and beyond to meet your needs. Excellent. Great condo, great service / people, unbelievable location, will be back. Great as usual, and much thanks to Sue for pushing to get our skis. We've been coming to Snowmass for 26 years for our family's annual ski vacation and staying at the Shadowbrook for most of those years. The service is always excellent, condos are well kept and clean. Access to the slope for skiing is the best! True ski in/ski out.